Gurren Lagann is a legendary anime that can even compete with DBZ with its reputation. It’s famous for many reasons and one of those is the fact that it’s known to have the strongest fighters in all of media. This is not counting abstract beings like the One Above All or the Presence because these guys are still physical (for the most part) beings who rely on good ole punching and shooting. It may or may not have the strongest fighters out there, but that’s the general conception that you’ll get as you prepare to watch this anime. 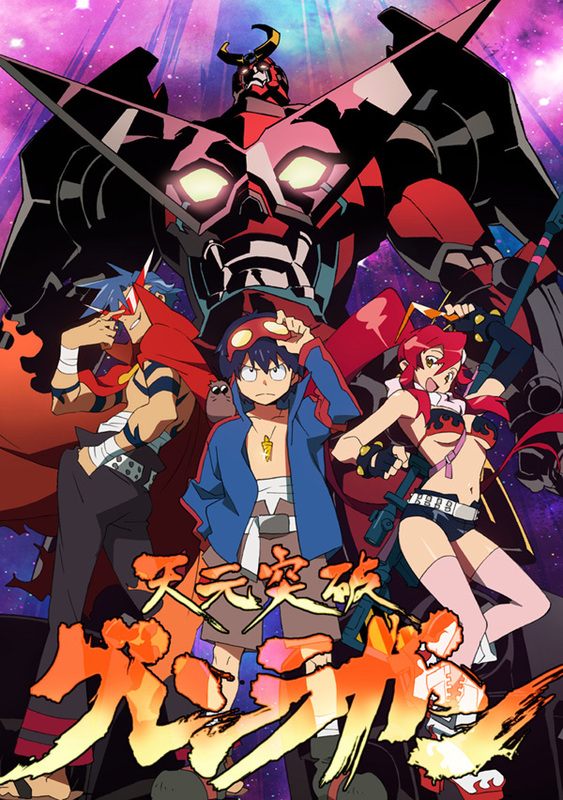 After the abomination that was FLCL; I’ll admit that my hopes for Gurren Lagann had definitely sunk. Luckily, this was nothing like that show and once the action really got going, things started to click. Is it the greatest anime of all time? No, but it does have some of the greatest fight scenes of all time and you won’t be forgetting the show once you’ve seen it! The show is basically divided into two arcs. The first arc is longer and that’s where we shall begin to discuss the plot. Simon is a part of an underground colony of humans and his digging skills have proven to be very useful. Humans were chased from the surface eons ago and now they live underground. The world above ground is ruled by a being known as the Spiral King. He is protected by legions of Beastmen as they incinerate any human that dares to go above ground. Beastmen pilot giant mecha robots named Gunmen that have pretty impressive abilities. 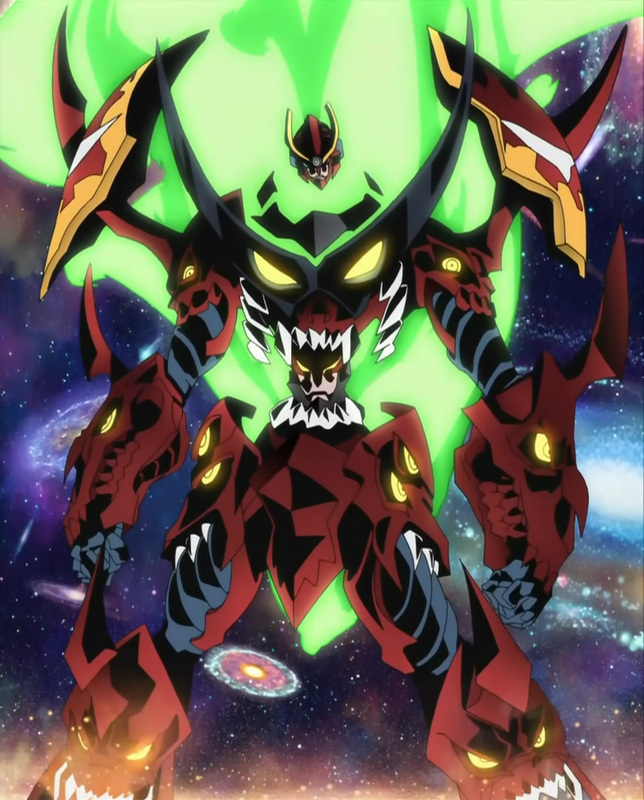 One day, Simon finds a robot named Lagann and he uses it to fight off the Beastmen that infiltrated his village and makes his way for the surface. I should mention that he was goaded on the whole time by his pal Kamina. Kamina is the rebel of the village and he’s always telling Simon about how they should get back onto the surface. He got his wish and the two of them make their way to the planet’s surface along with a girl from another village named Yoko. She works with a group of humans who have some mild experience fighting Beastmen and they actually know how to deal some damage. 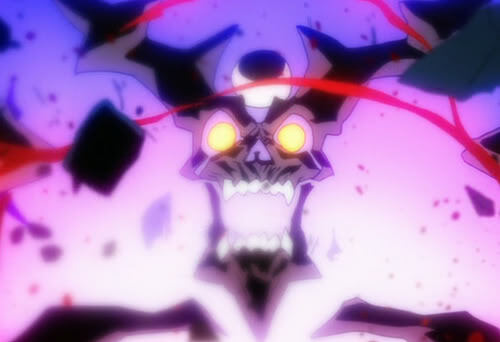 The heroes deal with small threats for a while, until Kamina takes over one of the Beastmen and uses it to fuse with Simon’s Lagann to form…Gurren Lagann! This is essentially when the series really starts and they face many enemies. The Spiral King has several generals at his command and a big character from his side is a Beastman known as Viral. Viral is very impressive and he will be discussed more as the review goes on. Needless to say that he’s a very cool character! Can Simon and his friends take down the Spiral King, or have they been destined to fail all along? The second arc has a pretty big timeskip and Simon is now a lot older and more experienced. The world is now at peace and humans have managed to advance a lot in such a short amount of time. They’ve created many cities and have a lot of futuristic equipment. Is this a little too fast to be realistic? Well, I wouldn’t expect much realism in a show where robots can crush Galaxies, but there actually was something off about it. It’s because the humans all have the ability of the Spiral within them. The Anti Spirals decide that Earth has grown too powerful and now that the population has reached 1 million, they are to be eliminated. After incinerating the city before Simon can stop them, the war begins. Arc 2 can be annoying at times because a traitor by the name of Russio has usurped control of the government and he nearly jeopardizes everything. Eventually, Simon and his pals are forced to team up with Viral as they head off to face this new threat. The leader of the Anti Spirals is a being that is made from the consciousness of billions of people and his powers are absolute. The Spiral King pales in comparison to this threat, but they must fight on! It was already near the end of Arc 1, but Simon quickly did a 180 and his attitude became more like one that you would expect from a fighter like Ichigo or Naruto. Simon was now brimming with confidence and he never looked back. From then on, Simon quickly rose up the character ranks until he finally became my favorite hero in the series. In Arc 2, Simon stayed as a very cool character. He made some errors and I don’t agree with his very ending, (Hermit) but he continued to inspire those around him until the very end. Breaking Galaxies is no small feat and Simon went up against some pretty steep competition, but he never let it stop him! I dare say that Simon is the best main character that I’ve seen in quite a while! Nia didn’t enter the series until the end of Arc 1, but she’s a decent character. Her personality isn’t one of my favorites for a character as she does not know much of human cultures and acts a lot like Starfire. It’s just not too amusing after a while, but Nia was the one who gave Simon the push that he needed. That is enough to make her a good character in the show, but she reached her height in Arc 2. She gained pretty impressive abilities in that part of the story and her personality did a 180. This was the true Nia, before she lost her memory…or even before that. It was her personality that was hidden inside of her until the time was right. The Perfect Double Agent technique! She gets one of the more tragic endings in the show, but she had a good run. Viral is a character that was awesome right from the start. His theme music is easily the best theme in the show and you won’t be forgetting it. It’s only fitting that a character of his skill level should get such an incredible theme. He’s a solid hand to hand fighter and he also gave Gurren Lagann a pretty good fight back in the day. He was also around for the end arc fight in the first chapter and even had a hand to hand match against Simon in Arc 2. His abilities definitely outrank the average Beastman’s and he’s a great rival for Simon. Yoko is the main heroine of the anime and she is one of the few main characters to not use a mecha. She does use them occasionally, but she prefers to just use her rifle. It’s not a bad gun, but I don’t see why she would use that against such powerful beings. She’s a decent character, but she associates with Kamina and he naturally drags her down with him. Once he’s gone, she manages to move past that and continue to help save the world. She’s a good character, but she would have been a lot better if she had decided to use her own mecha. Becoming a teacher was a solid idea and she can make a difference in the world! Kamina is the worst character of the series and I can’t stand him. It’s unfortunate since Kamina is basically the fan favorite character of the series and he had the potential to be cool. Kamina never runs away and he’s always confident that they will succeed, no matter what the odds are. He defies authority and he might be the only human capable of fighting a Beastman on equal footing without the power of the Spiral. Those all sound like good qualities and he could have been the best character in the series. What drops Kamina drastically down the ranks and into James Bond territory is the fact that he’s a very perverted character. He’s one of the main reasons why I can’t give this show a 9/10 like it would have gotten. Kamina falls for every trap in the book that involves Yoko and friends and he made for some pretty excruciating episodes. The Hot Springs episode is basically the only episode that you need to mention in order to know that Kamina is one of the worst characters out there. Kamina is pretty despicable and the show got so much better once he died. The Spiral King is easily one of the cooler characters in this show as long as you remember that he is a villain. The thing is, The Spiral King is pretty awesome, but you have to ignore certain things to realize that. He does throw away his kids after he’s bored of them and he obtains many kids throughout the years. Automatically that means that he’s a really bad character and almost as bad as Kamina. It’s just easy to forget this because he is very cool when he fights Simon and he looks good throughout Arc 2. Still, we can’t just forgive and forget in this case, so I have to say that he’s not a good character overall. That being said, his sob story was very hard to sympathize with and I didn’t buy it at all. He basically just lost hope and fell for the old trap of believing in legends. His main fighting robot is Lazengann. The Anti Spiral Leader is the final boss of the series and one of the best villains that you’ll come across. He is the will of his whole race as they went into eternal slumber. His goal is a little intense so try to keep focus as I explain. All creatures have the potential to develop the Spiral power and humanoids are able to use it best. The Anti Spirals believe that the Spiral Power will eventually destroy the universe because they can just tell. When you have the Spiral Power and are at a high enough level, you just know that the Universe will ultimately be destroyed. The power just becomes too great and the universe cannot contain it. After seeing the final battle of the series, you can also tell that the villain is right. That being said, he is a villain. His race decided to go to sleep forever so that their spiral power would not destroy the universe and then they merged their souls into one being. The being was given infinite power and he can essentially wipe out reality with a thought. He erases any race that starts to grow too powerful with Spiral Power. When Earth cracked 1 million in their population, the Anti Spirals knew that it was time for them to die. The leader could have incinerated Simon and his pals instantly, but he wants them to know despair. So, he took a physical body and made his own mecha to fight the heroes. He reasons that humans will keep on trying to reach the stars unless they feel total and complete despair. Thus, it was time for the final battle to begin. I don’t agree with the Anti Spirals, but they are a really cool race of beings and the leader is pretty awesome! 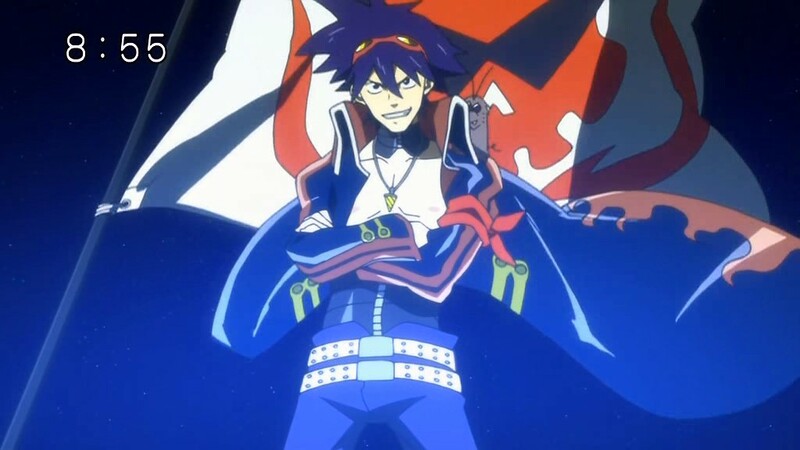 Behind Kamina, Rossiu is the worst character of Gurren Lagann. He’s completely unlikable and also a total traitor to the cause. He was decent in Arc 1, but he quickly became one of the most despised characters that I’ve seen in quite a while. He ends up taking Kinon down with him and she becomes one of the worst characters in the series as well. He doesn’t learn from his mistakes and makes every possible mistake. He believes that it’s okay to sacrifice people for the “greater good” and he also starts to act exactly like the Spiral King. He forces people to live above ground and chases them out of their safe homes. He also arrests Simon so that Earth can be defenseless and locks away Gurren Lagann. Making things even worse is the fact that he decides to destroy the mecha. He also steals Simon’s drill so that he can rub it in. He also kept the Spiral King’s head so that he can force him to do whatever he wants. Rossiu just keeps on sinking and sinking as the show keeps going further. Finally, he gives up on Earth and leaves everyone to die as he takes some people with him and they try to flee into space. Luckily the Anti Spirals were around to stop them, but it can be painful to watch him act as leader. Right up to the very end, Rossiu continues to show his true colors as he tries to leave Simon to die after Simon ends up saving him once again. He’s definitely not a true pal and I consider him to be a traitor. He gets a second sob story and a very happy ending, but I don’t think he really deserved one and Simon was way too nice to him. His second sob story was also one of the fakest things that I’ve seen in a while. It was added to make him sympathetic, but I didn’t buy that for a second. Boota is around for a while, but he is just a supporting character that is around for a while. I never cared for him and his plot twist at the end came out of nowhere. He thought that he could fight the Anti Spiral Leader, but it was not to be. Boota is the animal mascot of the series, but I didn’t like when his tail was eaten and he wasn’t really needed in the show. Chalk up another negative hero for the series! Leeron is the genius of the series, but he’s not likable either. He likes to mess around with the main characters. Simon typically ignores him, but he tended to get on Kamina and Viral’s nerves. I can see why and his character design can also be a little off putting. He is decently smart, but it’s not enough to save his character. So, in the end we had several “Heroes” that were not likable. Kamina, Boota, Leeron, and Russio were not good characters while Simon, Yoko, Nia, and Kittan were solid. That’s a little too close for comfort if you ask me! It can be a little tough to root for the heroes, but it’s easy to root for Simon. Cytomander doesn’t appear for very long and I can barely remember him. He’s a decent villain, but you shouldn’t expect him to be a match for someone like Simon. Cytomander is tough in his own right, but by the time he is ready to fight…it’s too late! He is nice to the others and doesn’t fight unless he really needs too. Well, that didn’t really turn out so well for him. Thymilph is another one of the generals and he is responsible for taking Kamina down for the count. He’s a decent villain and there’s nothing wrong with him. That being said, there isn’t much for him either and you’ll mostly just end up enjoying his mecha fights. This guy can definitely fight, but that’s all I can really say for him. Adiane is the water general and she is able to create large amounts of water that help her mecha to have the advantage. She nearly defeated the heroes during their first encounter, but she had to leave because of the Spirit King. She beat up on Viral a lot and could only be considered as a decent villain. Again, there’s no real reason to root for her and her abilities are only a little impressive. She did manage to almost terminate the heroes, but Simon wasn’t quite himself at the moment. Guame is the first of the four generals to be defeated (Or at least it felt that way!) and it’s easy to see why. He completely depends on his mecha because he cannot fight for beans. He is not a fighter and you can’t take him seriously. He’s just completely unlikable and you’ll be eagerly awaiting for the heroes to take him down so that the next villain can arise. His ship was also far too big to be a real fighting threat. All right, characters aside…it’s time to talk about what kept this show from being a 9/10 and one of the greatest anime of all time. It all comes down to the Fanservice. There is just too much of it in the show to warrant such a high rating. This is at its worst during the first few episodes. The Hot Springs episode can be pretty traumatic in this area and Kamina doesn’t help matters. After Kamina’s death, the fanservice definitely dies down although there are still moments where it’s present. Unfortunately, like To Aru Majutsu No Index, it will always be present with the series. Still, if the first few episodes with Kamina had been completely erased; the series would have been that much better. I just can’t get past that Hot Springs episode because it was FLCL levels of awful. That’s definitely something that can pull a series down. The fanservice is really the only big negative of the series. The fact that Simon and friends eat Boota’s tail can also be nauseating, but the scene is quick and you can try to forget it. I also place most of the blame of that scene on Kamina since he was the one who was complaining the whole time. Russio can also be considered a negative since his scenes were very cringe worthy and his ending is undeserved. He gives the viewer someone to dislike, but he got away with just about everything. The series definitely started on an iffy note with the first few episodes. After seeing them, I also had to say that I thought their reputation was undeserved. After all, until the very final episode, you couldn’t really call them Star Busters, much less Galaxy Busters. The fial episode threw everything out of the window and that was epic. The series reached its high point during the climaxes of both arcs. Arc 2 was really epic since the scenario took place during a futuristic city and we got to have another hand to hand fight. If you can bear through the first part of the series (AKA, the part where Kamina is still alive) then you should enjoy the rest of the series. It only goes up from there after all! Arc 2 starts with a bang and part of the reason why it’s so cool is that it’s very different than Arc 1. It’s night time towards the beginning and we have to deal with an alien invasion. That is enough of a reason to love Arc 2 immediately, but the plot is also more engaging. Arc 1 had the best Simon, (Once he manned up) but Arc 2 definitely had the better plot. As far as final fights go, they were both really close so that’s harder to gauge. Still, how often does the main villain throw galaxies (Or was it universes?) at the main hero? It’s awesome to see how intense the power levels get in the final episode! The Animation for this show is leagues ahead of FLCL and you won’t even know that it’s the same company. (Except for an extremely annoying character in the final seconds of the show who looks like Takun and I instantly didn’t like him) The animation really gets to shine during the fight scenes. 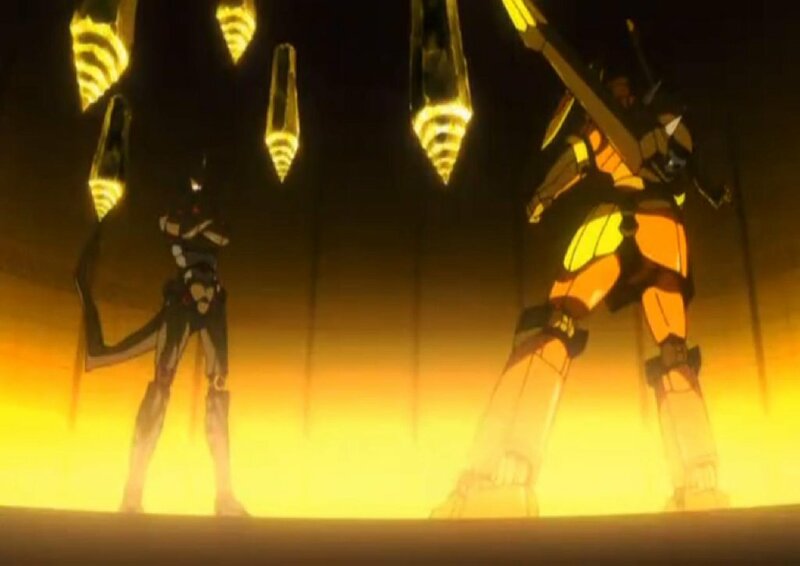 Gurren Lagann’s fight against Lazangann is epic and one of the best anime fights out there. The same could be said for Simon’s fight against the Anti Spiral leader. Both of these fights can easily hold their own against any other anime fight and should not be missed. The anime may have come out years ago, but it holds up against any current anime and puts all of Marvel’s new animated adventures to shame. This is what I call true animation and it’s something that should be remembered. The soundtrack is also pretty solid. The theme song is one of the best in the biz and it makes for a perfect insert song during the aftermath of the big battles. The lyrics also make sense and it’s very upbeat. Nikopol is another big song and it’s known as Viral’s theme. It’s definitely a solid battle theme and when it pops up in the show, you know that things are about to get real. The only part of the soundtrack that can be annoying is the “Fight the power” that they add into the mid episode bumpers towards the end of the show, but they wisely cut it out for the final. It can quickly get on your nerves and make you wince a little inside. One of the reasons why the show is so fun is because it’s very upbeat. A lot of sad things happen like most of the cast being destroyed in one of the final episodes, but there’s always an underlying message about believing in one’s self and always trying. Failure is not an option and no obstacle is impossible to overcome. Those are the messages that the show continues to shoot out, but not in an obvious way as they’re just hidden in there. You’ll typically walk away from the show feeling good and ready for whatever comes next. I wouldn’t call it a little perversion on Kamina’s part and he’s about as bad as James Bond, Captain Kirk, Jack Sparrow, or any other modern film star. The hot springs episode was really the one that made me despise him more than almost any other character. He’s easily the worst character that I’ve seen since James Bond and it’s just sad. I can see why people like him and if I ignored all of his (many) awful scenes, then I would as well. Still, I just can’t overlook it. The fanservice was pretty abundant and more so than nearly any other anime that I’ve seen. (Only competition would be A Certain Magical Index which probably has more) That does need to strike the series down by at least two points. I definitely mark down all cases that involve fanservice and perviness, but romance doesn’t always make something go down. If it’s handled right (Which is extremely rare) like Tsubasa, which is a classy romance that is actually okay, then it’s fine. Otherwise, such things really have no place in any form of media. They’re only encouraging people to become perverts by adding fanservice and despicable people like Captain Kirk and James Bond. Most people don’t see Bond or Kirk as despicable at all. Jack Sparrow… he’s slightly despicable, but he IS a pirate, and his negative qualities as well as his positive ones (and just kind of weird ones) are what make him funny and enjoyable. People have some negative qualities as well as positive ones. Hot springs episode-wise, we all know he was going to save the girls right after he’d seen what he wanted to see. I certainly wouldn’t allow it to outweigh all his positive attributes. I only comment on this being weird because while too much fanservice is definitely bad (There are definitely some anime that go to far with it), you’re definitely the easiest-offended person with regards fanservice and perversion I’ve ever read the words of. Your priorities just seem bizarre to me. How can you judge Kamina for a little perversion and claim to despise him yet claim to like Sasuke Uchiha who betrayed basically everyone he has ever met for power and a completely warped sense of revenge? How can you, back in your Fantastic Mr. Fox review, claim Mr Fox to be the real villain for a bit of (perfectly natural, given he is a fox) hunting of other animals, and the “hero” to be Bean, who was willing to kill all the burrowing animals in the area over one feud with Mr. Fox? Unfortunately, it is true that people do like Bond and Kirk. Then again, people didn’t like Man of Steel, which is the greatest superhero film of all time. Jack Sparrow has no positive qualities…. Saving the girls was not exactly high on Kamina’s to do list and he didn’t seem to care for their well being as he urged Boota to keep on tightening the trap clothes. Didn’t he figure that it might cut them in half, break their bones, or blow up? Yes, he likely considered this and then didn’t care since his priorities are never straight. That’s definitely enough for me to override any possible good qualities that he may seem to possess because it just throws them out the window. Trust me, I take that as a compliment. I make sure to take a shot at any anime/comic/movie/tvshow/book (Luckily, I’ve never really read a book with fanservice) that has fanservice. It’s just unneeded and I have to make sure to point that out. All right, we can’t even compare Kamina to Sasuke. First of all, there is nothing perverted about Sasuke and he actually goes against that. Now, you bring up the point that he’s betrayed everyone for power and Completely legitimate reasons for revenge. The village ordered Itachi to destroy everyone and he did. Itachi shouldn’t have done that, but the Village still placed the order so of course Sasuke should murder them all. That being said, Sasuke is not a hero, but he’s a very likable villain. He’s an incredible character and someone that you can root for. For Kamina, it doesn’t matter if he’s a villain or if he pretends to be a hero. I just don’t like perverts and that’s what Kamina is. Sasuke wasn’t getting any stronger and if he stayed with the leaf, he would have turned out like Naruto. (Minus Naruto’s Sage Mode and Fox abilities) That would have been pretty sad. It’s not good that he betrayed everyone for his hero argument, but it didn’t hurt his character. He’s a great villain. The difference between Mr Fox and Mr Bean is that Mr Fox actually destroyed an animal. Mr Bean intended to do so, but he didn’t actually destroy any. Not to mention that Mr Fox started the whole war and it was really his fault. Mr Bean was just retaliating as I would if someone attacked my animals. I’d definitely take him to court so that they can bring order to this chaotic universe. I never meant that Sasuke was a pervert. Turning out like Naruto is by no means a bad thing. Sasuke is a psychopath and I was “rooting for” almost everyone he went up against – all the kage, even Danzo. Not that I don’t enjoy Sasuke as a villain, and it’s looking like he might go good again which might work out alright, but Kamina’s a better person than Sasuke could ever hope to be. I can’t compare Kamina to Sasuke either, but for the opposite reason. So you’re saying that good and evil can be decided entirely based on competence? That doesn’t make a lot of sense. Also, Bean’s feud with Mr. Fox dragged all the other animals into it as well. I still stand by the fact that those three characters have no redeeming characteristics. His “cunning” is usually just a lot of luck and plot hax. Over half of his plans should have failed if those guys could shoot someone who’s at point blank range. The fact that Jack lives is always very convenient since soldiers can make that kind of shot. James Bond has absolutely no redeeming qualities and is probably the worst character in all of media. Every time I see a scene of him I wince and make sure to give him a bad review and drop him on the blog. I didn’t mean that you implied that Sasuke was a pervert. (My wording was a little confusing) I just meant that a character being a pervert automatically makes them sickening to me. Sasuke turning out like Naruto would have been awful and I don’t mean personality wise. Naruto went with Jiraiya and trained for nearly 3 years…and didn’t improve at all. Sure, he got a bigger rasengan, but his friends actually kept pace with him. There’s a good reason for this…Jiraiya never found out what Naruto’s element was (Since Kishimoto hadn’t thought of it yet) so he couldn’t develop a good training method. Naruto didn’t master the fox power either so it was a complete waste. If Sasuke had stayed, then he would be far weaker and know less ninjutsu. The Akatsuki would have slaughtered everyone by now since Danzo would probably be ruling everyone and aside from Sasuke, nobody would dare to defy the government. Sasuke is evil, but he’s awesome. He’s someone that you can root for. He doesn’t torture people, cause unnecessary harm, or do any other things that would make him a despicable person. If he did, then I wouldn’t like him. Instead, he just destroys people quickly and does what he has to do. He’s a much better person than Kamina. I don’t want Sasuke to turn good. I don’t mind him coming back to the leaf, but they better acknowledge that he’s still essentially evil. He’s come too far for that. No, Kamina is definitely not as honorable as Sasuke, someone of his level just isn’t close. He also destroyed a defenseless animal when he was practicing his shooting. A. I don’t buy that for a minute. They were going to revolt…but I would have revolted in that situation! The 2nd Hokage was extremely racist and they had already taken most of the space from the Uchiha. The whole village had to live in a very small area while the village got to take everything. It was completely unfair and like how we had the Revolutionary and the Civil Wars, the Uchiha were going to defend what was theirs. It’s still the village’s fault. B. Itachi did it, but that still doesn’t matter. He was pressured into doing it and the Village would have murdered the Uchiha anyway. He made a very bad decision, but Sasuke is just going to make sure that he’s avenged. Itachi loved the village, but Sasuke had no reason too. C. It’s unavoidable. Sasuke’s targets are the elders of the village and the Hokage. To get to them, he would still have to take out the Jounin and Chunin. He would likely spare the people who didn’t get in his way. The feud dragged everyone else into it, but Mr. Fox started it. Mr. Bean still can’t be considered as a total hero since he took drastic measures and I can agree that he’s still a villain as well. He’s simply the lesser of two evils and he was defending his turf. Right up to the very end, Mr Fox continues to steal as he finds that market. He’s anything but heroic. Good and Evil are very hard to define and it’s tricky, especially in these modern characters who almost always have extremely negative traits while acting as heroes. I’m a Christian and I use the Bible to root things out, but it would be an extremely long comment to go into depth and it’d be tough to word it correctly. Regardless, there are still characters that I can call true heroes. Naruto, Ichigo, Gon, Superman, Batman, the original Captain America (1960’s) etc. It’s most of the Hollywood protagonists that I can’t call heroes like the main character of Battleship, Transformers, etc. There are no “plot hax”, whatever the heck those are. With Jack pulling off the stunts he does, he’s usually either moving too fast or being too surprising to get a clear shot. So for all his good points, you’d still hold it against, say, Jiraiya? Naruto went with Jiraiya and trained for nearly 3 years…and did improve quite a bit actually. Sure, all he seemed to get new-flashy-technique-wise a bigger rasengan, butJiraiya taught him more than just flashy Jutsu. good training method. Naruto didn’t master the fox power either so it was a complete waste. “If Sasuke had stayed, then he would be far weaker and know less ninjutsu”, you say? Kakashi, the man who has mastered over a thousand jutsu would’ve been unable to teach him what Orochimaru did, which basically comes down to a couple of new applications for the Chidori (a technique Kakashi not only taught him but also invented no less), the Curse Mark (which he loses later on) and giving him a fancy sword? Three years and he just came out of it with that? Even without the threat of Orochimaru taking his body Kakashi seems like a better option. He even has a Sharingan for goodness sake!. 2. The Akatsuki would have slaughtered everyone? I don’t know about later in the manga (or wherever you’re up to) but right now anime-wise the akatsuki consists of Tobi and Madara (plus Zetsu, wherever he’s gotten to). Itachi could have defeated Kabuto on his own, leaving them in the exact same situation as they are now in except Sasuke could have helped Naruto fight Madara and whatnot directly. Heck, even Danzo could have been a big help in the war – powerful wind-style jutsu, a good summon (I assume. We didn’t see a lot of his Baku, but it’s the first entirely mythological summon, that’s got to count for something), and enough Sharingans to make Izanagi actually useful instead of a one-time get-out-of-jail-free card. If you honestly believe Sasuke is fundamentally a better person than Kamina, I don’t think we’ll ever come to an agreement. A. The Uchiha complex was way too big to begin with! Also, what evidence do we have that the Second Hokage was racist? The Uchiha clan don’t even constitute a race, they’re a clan. So the Uchiha had to live in regular houses like the rest of the ninja. Did they think themselves so much better as to have all this space as personal Uchiha space? That doesn’t seem particularly fair. It’s not like they could have expanded the village, either: Once you build walls that huge, you pretty much limit the maximum size of the village. Granted, the Hyuga got to keep their complex, so it’s not all fair, but they weren’t taking up nearly as much as the Uchiha. B. If Itachi only did it because the village pressured him into doing it and would have killed them anyway, why did he back up his viewpoint after he was resurrected? He loved the village, he died with everyone seeing him as the villain so both the village and Sasuke could live in peace (at least, that was the idea, until Tobi ruined it), and Sasuke is going against everything Itachi wanted. To put it simply, ITACHI DOESN’T WANT TO BE AVENGED! C. Of course he’ll spare those that don’t get in his way. That conversation with Naruto where he said he was going to kill every man, woman and child in the Leaf never happened, right? That’s stereotyping them all for the actions of a few. They were extremely mean to Naruto and made his life a living nightmare, true, but if he can forgive them, so should you. They all had bad memories of the Fox, and there are definitely a lot of good people in the Leaf. The 3rd told everyone they were not allowed to tell people about what happened so that Naruto would be spared from the next generation having it in for him as well.And what the heck’s wrong with the Soul Society now?! There was a lot of plot hax and it’s especially prevelant in live action films, although it’s definitely there a lot in anime as well. Plot hax is just when something happens that shouldn’t. Catwoman doing a fancy double flip while dozens of guards are shooting lasers at her is one example in her first appearance in The Batman. At least one shot would have connected and disintegrated her, but it didn’t. A lot of times, Jack is up against armed professionals and they all miss their shots for no reason. There are many times where he should have been defeated. Yes, I can’t stand Jiraiya. He basically represents everything that I dislike in a character. Pervertedness, the old “Comic Relief characters who’s actually “tough”, his reputation is better than his abilities, etc. Jiraiya is easily one of the the worst Naruto characters of all time. Jiraiya’s training methods are awful at best and Naruto was basically cheated out of 3 years. He should have been so much stronger by that point and if he had stayed at the village, I’m sure that he would have been stronger. Jiraiya just doesn’t focus enough and he didn’t make Naruto stretch his limits. Kakashi’s title is basically because he’s learned all of those moves with the Sharingan. Most of them seem to be useless in combat or else he would have used a few against Zabuza, or any other opponent. No, Sasuke would have been majorly doomed if he had stayed. With Orochimaru, he amped up his speed, strength, defense, learned teleportation, summoning, and a variety of other things. Kakashi probably wouldn’t have thought to give him a sword and he wouldn’t be too great at Sharingan training either, due to his limitations. Orochimaru and Kabuto are some of the most knowledgeable characters in the series so they’re much better at the training game. The main thing that Orochimaru helped Sasuke was with his physical attributes. His speed was so great that he was able to move faster than any of the 5 Kages could react and he also speedblitzed Team 7. That’s some pretty insane speed and he did keep up with the Raikage. I just doubt that Kakashi could have helped with that. The Leaf Village would still be under Danzo’s rule, just not the alliance. The Leaf Village knows that he’s shady, but they probably wouldn’t care out of a “Sense of Honor” Danzo would likely assasinate Tsunade in her sleep to keep himself as Hokage and then do away with anyone that he didn’t like. Sure, he would have helped out in the War, but he would have made the village even more evil. I’m sure that many of the residents would actually agree with his methods. Also, the Akatsuki would have won. Tobi would be able to incinerate Danzo very quickly and without Sasuke to essentially end the arc, it would all be over right now. I’m not sure if you’re current with the manga or following the anime, but Sasuke essentially saves the day by providing some powerful reinforcements and also landing some crucial blows. The Alliance would likely be dead by now if not for that. If Sasuke had never turned evil, Itachi would still be alive and Naruto wouldn’t have had to train as hard. The world would be a dark place at this time. I do say that Sasuke is a better person than Kamina. They’ve both committed evil deeds, but Kamina’s is just worse than Sasuke’s. I do regret that Viral attacked the animal and it does hurt his overall score. (Along with his speech at the end with Simon that was extremely cheesy and unneeded. Simon’s part of the speech was good, but not Viral’s.) I hold it against him as well, but since that was his only mistake in the series, it’s not crushing. For Kamina, that was just one of numerous mistakes. A. It basically comes out that the 2nd Hokage is awful when Sasuke has his speech with the Kages. Not sure if the anime has shown that part yet, but the 2nd Hokage is just a terrible character. They go into great depth about how they cheated the Uchihas out of their territory because the 2nd basically wanted to get rid of them so he got the ball rolling. He basically wanted them to revolt so that he would have an excuse to destroy them. B. Itachi is just too nice for his own good. He believed that the Leaf did the right thing, since move lives would be spared. That being said, the Leaf still gave an awful order. Okay, destroy the perpetraitors, but why destroy all the kids, infants, and every Uchiha? I don’t think that everyone was in on it and the village was way too extreme. Itachi didn’t want to be avenged, but what he wants doesn’t matter anymore. He made his decision and he’ll have to live with it. Likewise, Sasuke has made his decision and Itachi will have to live with it as well. C. He was pretty hysterical at the moment and things weren’t going his way. He was probably just goading Naruto into a fight. The only nice person in the village was the Ramen guy. Beyond that, they were all mean. It wasn’t just a few. We’ve seen several dozen people snub him throughout the many flashbacks. The parents of just about every other kid, the mask owner, random adults who gang up on him, Iruka (For a while) etc. I don’t think that the Leaf has a lot of good people. A small handful perhaps. It was an awful plan on the 3rd’s part. The parents told their kids to avoid Naruto anyway. Concealing the truth went against the 4th’s Will and someone should have tried to stop the 3rd. Then again, the 3rd always was one of my least favorite Hokages. The Soul Society is pure evil! They’re even worse than the Leaf Village. They tolerate completely psychotic and evil captains like Mayuri and don’t even try to stop him. Yanmamoto is completely insane and wants to assassinate people for no good reason. (Film 2) They basically go around murdering people and doing whatever they see fit. It’s all right for people to murder the Captains and then take their place like Zaraki. I could go on for days about how corrupt that whole place is and why I was rooting for Aizen in the War, but in a nutshell, I can’t accept the Soul Society as a heroic place.